Things I Love: Smart Sampling with Clinique - Get 4 weeks worth of serum free! Smart Sampling with Clinique - Get 4 weeks worth of serum free! Want a free full-size equivalent bottle of Clinique skincare product? Of course you do and with Clinique's smart sampling you can from next week. 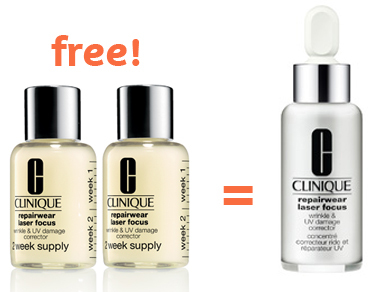 Clinique has set up a smart sampling initiative to give you 4 week's worth of their Repairwear Laser Focus serum. Here's how it works. Visit any Clinique counter in Myer from Sunday 31st March to Sunday 14th April for a skin consult and you will receive a 15ml bottle of their hugely popular Repairwear Laser Focus Wrinkle and UV Damage Corrector serum. This is equivalent to a 2-week supply for morning and night use. Come back for a follow-up consult 2 weeks later with your empty bottle and you'll receive another 15ml, 2-week supply bottle, bringing it to 4 weeks worth of product all up - all for free - that's equivalent to the A$72 full-size 30ml bottle! Plus, during your consult, you will receive tip cards and and advice, targeted to your specific needs. So why not head to a Clinique counter at Myer soon to see the results of this serum yourself - you don't have anything to lose, except for the potential of a few fine lines, dehydrated and uneven skin. Better yet, spread the words and tell your, mum, sister and girfriends (or skin-savy males friends) so they can experience this skin improvement themselves - all for free thanks to Clinique Smart Sampling. @Mandy - you're welcome. I love this as an all rounder serum. It refines the skin texture after 3 weeks use.